I enjoy reading your blog from time-to-time and especially appreciate the news on the developments around the neighborhood. 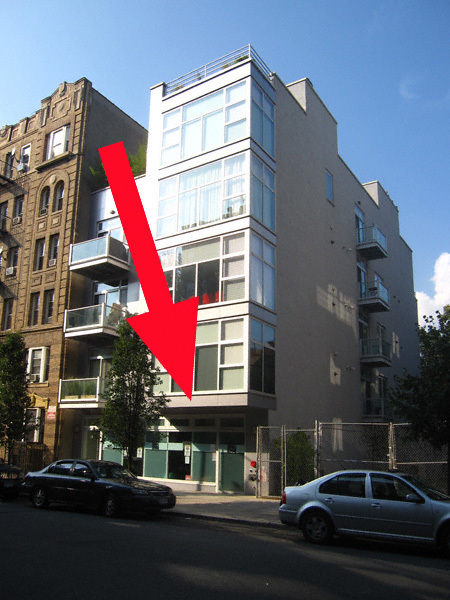 The building has a retail space in the bottom which is currently owned by the developer and being rented to a John Suarez, who is running it as a gym, called Cutting Edge. 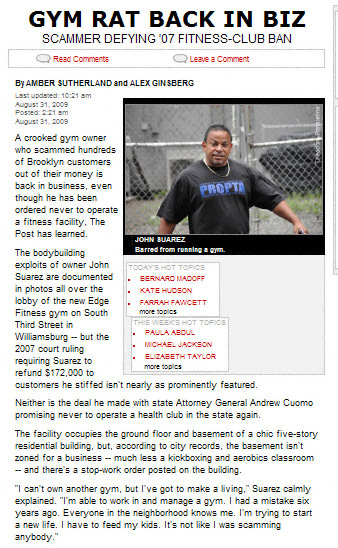 The biggest problem of all is that John Suarez has been forbidden by the Attorney General to ever operate a gym. A few years back he had advertised the opening of a new gym in the neighborhood, called Core Health and Fitness. He never opened the gym, even after taking people’s money. He was ordered to pay back $172,000 in restitution, but I know for a fact (a neighbor was a victim of the scam) that people did not get their money back. I lay odds 80% in favor of this being ripped off by the “print media”. I’d give it 90% except this actually helps people. On August 23 I took up the matter with Queens Crap and Forgotten NY. We agreed this item would be cribbed— but by whom? My knee jerk reaction was the New York Post. And as of August 31, 2009 my prognostication came to pass. Compare my fact-finding with Ms. Sutherland’s and Mr. Ginsberg’s “scoop”: they dovetail. I was more specific (because my source and I did our research). But am I cited? Of course not. Amber and Alex claimed this discovery as their own. i went to college with Amber Sutherland, haha…would have expected her to be above plagiarizing “unsuspecting” bloggers, but i guess the Post will wear down anyone’s journalistic integrity eventually. SCOOP FAIL. The NY Post has done this to me as well. On 01/08/09 I wrote a post about rust being visible at Citi Field that was picked up left and right all over the place. A couple of days later on 01/12/2009 the NY Post “broke” the story, albeit without even trekking out to the stadium to photograph the rust. The only thing good about the Post is shredding it up and using it for compost. That’s nuts!! – from the gym itself, to the guy’s past, to the assault on the photographer, then the Post stealing your story with no credit. It seems Mr Ginsberg was sincere enough in his comment, but I don’t understand that policy or why the Post can’t link to your alias site or mention your name when they become aware of a story as a result of your blog. That doesn’t seem right to me.